The first time I visited British Columbia, I was a teenager. I had vivid memories of how lush and green it was there. On a recent visit back, I saw just how much more “green” it has become now that Vancouver has regulated its medical marijuana dispensaries. I think at last count, there were about 100 in that city and Victoria has about 20. What a foreign sight inside some of these clinics. It seemed more like Amsterdam than a Canadian province. There are bowls and jars of pot everywhere you look. I strolled into one to take some photos. The only time I had seen that much marijuana in one place was at a police news conference after a drug seizure. One of the best laughs I had on my trip came after I asked the guy at the counter for some help. I explained I was a tourist and I wanted permission to take some pictures in the store. “Are you the manager?” I asked. “No," he said. “I’m a volunteer.” I roared. Volunteerism must be at an all time “high” in BC these days. I only made it as far as Vancouver on my last jaunt west across the country. So, I was eager to visit Vancouver Island and see how this west coast island compared to my east coast home. Of course, I expected it to be less rugged with a lot less wind. The Pacific is known as the calmer ocean compared to The Atlantic. As an adjective pacific means serene, tranquil, untroubled. Victoria’s colourful downtown struck me as being all of those things. And clean? I would have eaten off the sidewalks. It was late morning by the time we disembarked from the taxi and our timing was perfect for a 11:30am reservation. 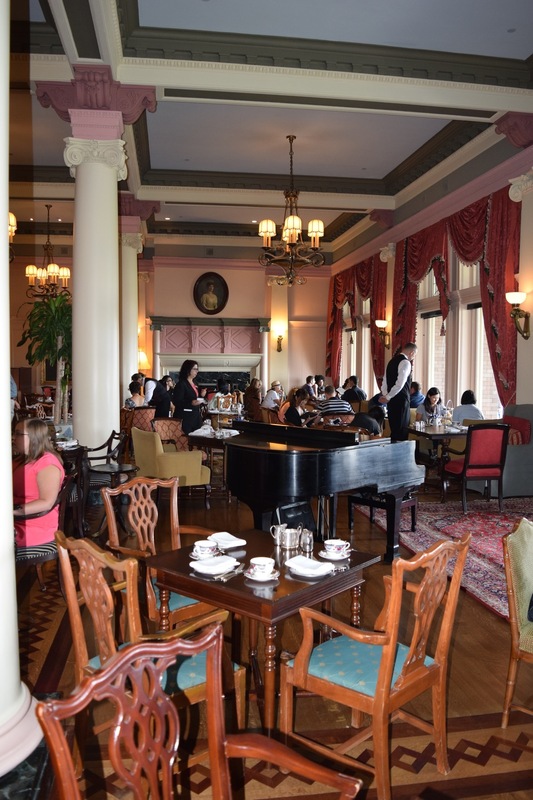 I know it’s one of the most touristy things you can do in Victoria, but I wanted to have Afternoon Tea at The Empress Hotel. I mean what tea drinker could resist this invitation on the hotel’s website: “Surrounded by rich chintz fabrics, antiqued tapestries and rugs, elegant wing back chairs, vintage furnishing and hand-carved tables, the picturesque backdrop of the Inner Harbour provides the quintessential Victoria experience to all who grace Afternoon Tea." I had asked for a window table and the view was perfect. I don’t know what it is about drinking tea from proper china cups but the daintiness of it all makes my posture improve and I’m prone to take on a British accent. Like a tea bag, I soaked in the luxurious atmosphere as a pianist played classical music on a black baby grand piano. It was lovely. Hey, if Afternoon Tea was classy enough for Queen Elizabeth II, Rudyard Kipling, Rita Hayworth, Bob Hope, John Travolta and Barbara Streisand, it was certainly going to be a highlight for me. Apparently 100,000 guests are served annually. That’s an estimated 500,000 cups of tea! So how did this tea tottling tradition all come about? Story goes that a woman in Queen Victoria’s court is credited with the ritual. Anna Maria Stanhope, the 7th Duchess of Bedford, was the lady in waiting for the Queen. Anna, once too gut-foundered (Newfoundland word for hungry) to wait for dinner at 8:30, rang down for some sweet snacks, bread, butter and tea to be brought up to her boudoir in the early afternoon. The Duchess began to do this quite regularly and invited friends to join her. When the Queen learned of the afternoon indulgences, she wanted in. By the late 1840s Queen Victoria was hosting daily, fancy dress tea parties. My kind of gal! The pretty china used at The Empress was first used by the hotel in 1939 for the Royal visit of King George VI and his wife, Queen Elizabeth. The pattern is now made exclusively for the hotel by William Edwards. And the special tea, The Empress Blend, comes from six estates, including Kenya, Tanzania, South India, Assam, Sri Lanka and China. But let’s face it, what’s a good cup of tea without a little plate of goodies. For $63 per person, you get a pretty lavish amount. There’s exotic sandwiches, strawberries and cream, scones, shortbread, tarts, mousse and chocolate. Never mind the medicinal marijuana clinics, the sugar high from The Empress will keep you buzzing all day! We lingered over every last morsel and drank in the scenery out our window. It was such a civilized way to spend a day. Before leaving we took a quick spin around the hotel shops and lobby. I was dazzled by stunning pieces at Stone’s jewellery and delighted to see antler carvings by fellow Newfoundlander, Clyde Drew, at the Creations Art Gallery. The Empress will have a different feel very soon. It’s currently undergoing a 30 million dollar renovation. Owner Nat Bosa is promising more modern rooms and improvements to the spa and swimming pool as well as the tea room. I do hope they maintain the old world elegance and charm of that space. Contemporary touches are nice but so is tradition. And doing away with tradition, well, as Queen Victoria might have put it, that’s not really my cup of tea. And, to take a look at some of the photos from my trip to British Columbia, please see them in the gallery. Are you a Rover too? Stay on the move with TNR! Enter your email address below to receive newest posts. 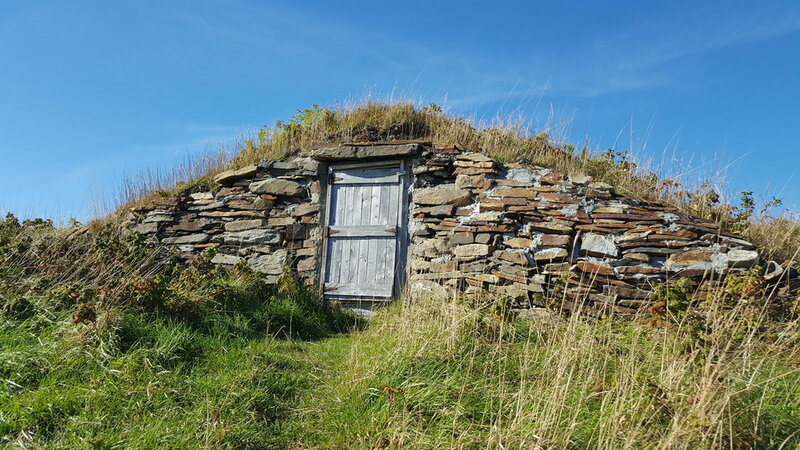 An old root cellar in Elliston, Newfoundland. Root cellar capital of the world! Check the Snazzy Snap gallery for more memorable travel photos from all over the world. Are you a Rover too? Subscribe to the Terra Nova Rover blog to receive the latest stories from a rover, all over.